Need to move your car, truck or van? We can transport any automobile as part of your move, or on its own. Get started with a free, no-obligation quote. 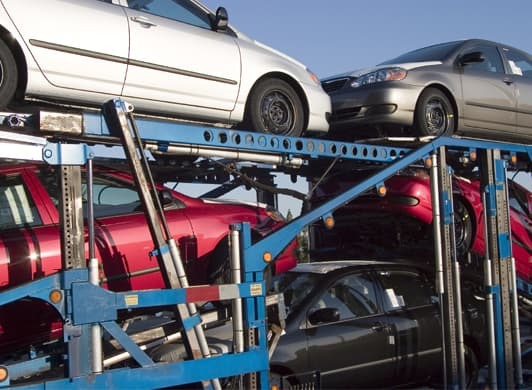 As an agent of Mayflower Transit and UniGroup Worldwide, Herlihy Moving & Storage offers dependable auto shipping to all locations throughout the U.S. and Canada via a fleet of enclosed and open-sided car carrier units. When you ship a car with Herlihy Moving & Storage you are assigned a personal coordinator to help you process paperwork, scheduling and billing every step of the way. Your coordinator will help you schedule your pickup, load and delivery times. If you select door-to-door car shipping services, our driver will pick up and deliver your vehicle at your home or office if possible. We only offer door-to-door car shipping service when permitted by local communities. If your neighborhood bans oversize vehicles from making deliveries, your coordinator will inform you of alternative delivery methods. If you are looking for a little more flexibility, your shipping coordinator can share terminal-to-terminal shipping options. A local shipping terminal may provide you with more flexible drop-off and storage options.